Carne Guisada is an excellent type of beef stew, it is savory with a bit of spice. 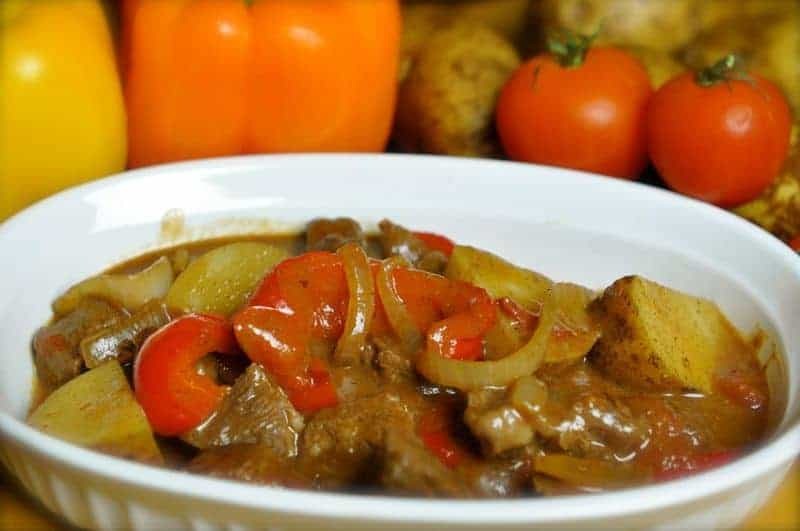 Beef is simmered with tomatoes, onions, cumin, and potatoes makes for an incredible fulfilling meal that is hard to beat on a cold day. I have often ordered this recipe when I have gone into many Mexican restaurants. When I was talking to one of my coworkers the other day, I spend my days running numbers for a company, and I told her how much I loved carne guisada, but I was certain it was difficult to make. She assured me you could make it at home, and it wasn’t difficult to do at all. With this encouragement, I went onto try to work on this recipe. If you have never had carne guisada I tend to think of it as a Mexican stew. This makes its own thick gravy. You may want to serve this with some Mexican rice, tortillas, or you may even want to eat this just like it is. I love how this stew makes its own rich and thick gravy. To make this recipe we are going to prepare this one in the crock-pot. For this recipe, you can use an inexpensive cut of meat like a chuck roast. You could buy already cut up stew meat, but I like to buy the whole roast, it is cheaper, and you trim it the way you desire. Please note: the cooking time is not correct the recipe. This recipe requires about 30 minutes of active cooking and then 6 hours in your crock pot. Crock-pot Carne Guisada is a savory Mexican inspired beef stew you are going to love. Cut chuck roast into bite-sized pieces and season with salt and pepper. Heat 1 tablespoon of cooking oil in a large skillet on medium high and cook meat until browned on all sides, when the meat is browned place into a 5 or 6-quart slow cooker. You may need to cook the meat in two batches. When the meat is removed add remaining oil and add chopped onion, tomatoes, chopped bell pepper, diced jalapeno pepper, chopped garlic. When the onions have almost become translucent add spices, flour, and stir to combine. When the onions have cooked through add chicken broth. Scrape the browned bits up from the bottom of the skillet. Pour the sauce over the slow meat in the slow cooker. Place lid on the slow cooker and cook on high for 4 1/2 hours. Place cut potatoes and cut carrots into the slow cooker and cook for the remaining 1 1/2 hours. Serve with either Mexican rice, and/or tortillas. This tastes even better the next day. This serves only 1 person? Green, red, yellow peppers, culantro, cilantro, recaito, garlic. I make this purée by the gallons and jar em and freeze in individual Tupperware or recycled jars. I add this purée to all my soups, beans and stews, it’s so popular in the Caribbean. I appreciate your comments it sounds like your family knows what they like. I made this dish based off my one of my co-workers talking about how difficult this was to make. She assured me it wasn’t. so what do i do with the diced tomatoes? I put those in the crockpot and let them cook down. You put them into the Crock Pot.